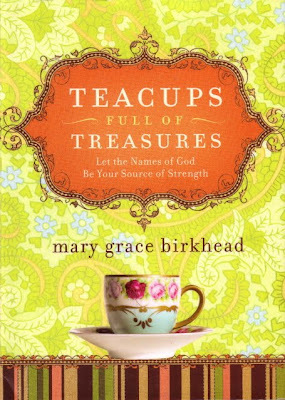 Tea and Books Saturday #9 - "Teacups Full of Treasures"
A couple of years ago I was browsing some racks of used books when I came across a delightful little gift book I'd never seen before, Mary Grace Birkhead's "Teacups Full of Treasures: Let the Names of God Be Your Source of Strength." It's a devotional book in which the focus is on the Old and New Testament names for God. 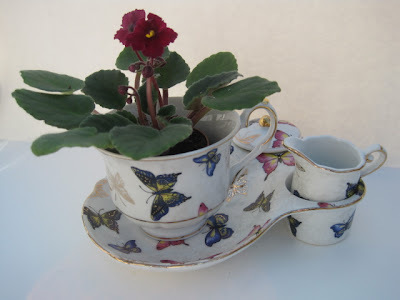 Its pages are illustrated with photos of teacups (the author was inspired by her grandmother's teacup collection), and of course I thought this was simply a great idea! Since many of the women I meet in "tea-dom" are involved in ministry, whether it's one-on-one or in an official capacity at their church, I thought some of you might like to be on the lookout for this book, which would also make a great luncheon gift (if you could find enough of them!) or speaker gift. Years ago, I took Kay Arthur's Bible study on the names of God, and I have to say it greatly enriched my prayer life. Instead of just going to God with my never-ending laundry list of requests, I love that I can reflect on *His* character during my prayer times. 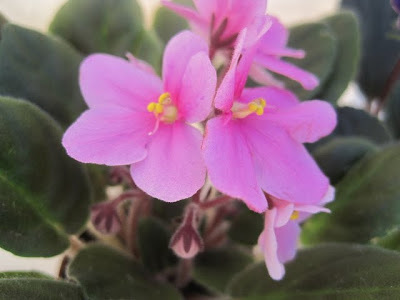 A friend's father had a heart attack this week, so I ask Jehovah Rapha (the Hebrew name meaning "The Lord our healer") to take care of him and heal him. An old friend from high school is still in dire need of a job, so I acknowledge that God is Jehovah Jireh ("The Lord who provides") as I ask Him to meet that very real need in her life. I like to read through these names of God periodically to remind me of the many ways God is able to meet our needs, and a teatime devotional on the names of God is certainly my cup of tea! 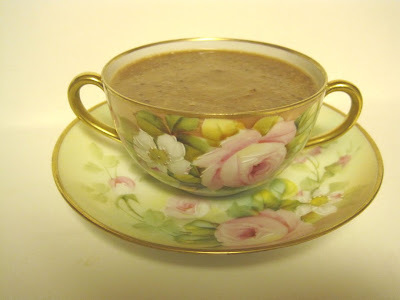 The tea cookbook I reviewed last weekend ("Tea: A Little Indulgence") contained a recipe for Black Bean Soup made with Lapsang Souchong, and since Ginger said she'd like for me to share any of the recipes I try, I thought I'd share this one, which I absolutely loved! The Lapsang Souchong (which I brewed weak instead of strong as suggested) added just a slight smoky note to the soup, which you make and then puree. I wasn't sure how that would work out, pureeing a soup containing black beans, tomatoes and rice, but the texture was very light and cream-soup-like, something I'd be perfectly happy to serve at tea. I also left some of the soup "whole" and took it to the office for lunch. It was equally tasty, just with more of a vegetable soup look. This was an easy, tasty and nutritious soup, and if you have some too-strong, smoky tea on hand, you might want to try this yourself! 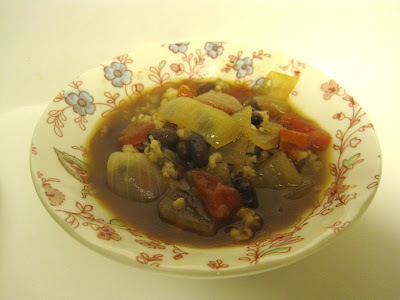 I am including the recipe as I made it, because I substituted brown rice for the white and would recommend that as well. Over medium heat, sauté onions in oil until they're translucent and starting to brown. Add garlic and sauté for another minute. Add water, beans, tomatoes and rice, then bring to a boil. Reduce heat and let simmer about 30 minutes. Add salt and pepper to taste and add tea, mixing well. Transfer in batches to a blender or food processor and puree on high. Yields 6-8 servings. 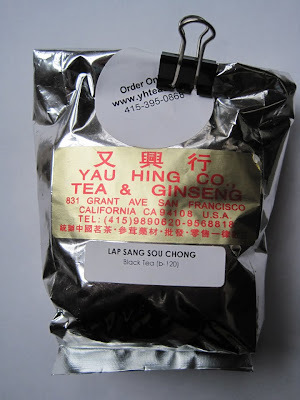 Occasionally I hear from tea vendors asking if they may send me some samples of a new tea, and I am always happy to try something new. 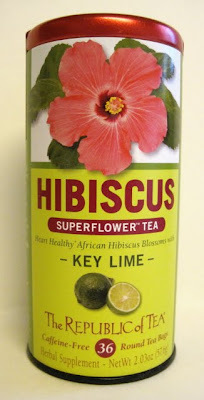 I was curious, though, to see what this Republic of Tea Hibiscus "Superflower" Tea was all about. Have you heard of it? I had not. The familiar shaped tin arrived in the mail, and I eagerly removed the lid and got a nice whiff of Key Lime, the flavor I received. (The others in this line are Natural Hibiscus flavor and then Hibiscus Blueberry, Hibiscus Vanilla Apple and Hibiscus Pineapple Lychee.) The company quotes a report presented at the 2008 American Heart Association annual conference which found that "drinking hibiscus tea lowered blood pressure in a group of pre-hypertensive and mildly hypertensive adults." I am always very intrigued by the large number of studies touting the health benefits of camellia sinensis, but since this is an herbal tea I can see I need to start collecting information on herbal teas' benefits as well! That said, I wouldn't bother mentioning the tea if I didn't like the taste of it, and I have to say I *love* this one! 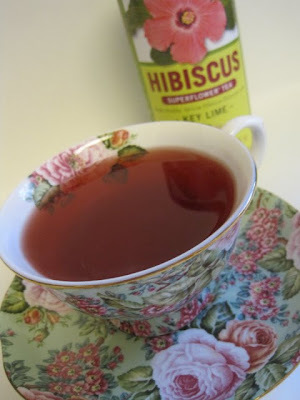 The herbal/fruity teas that turn a deep red in the cup often seem to have a tart or sour taste to me, but this one did not and featured just the right touch of lime. 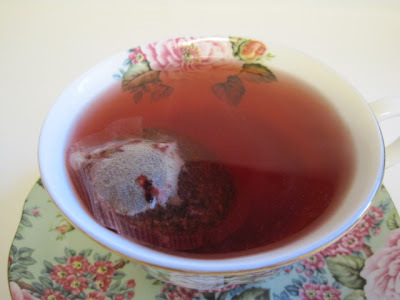 It had a rich and almost brothy taste with such a sweet finish that it made this seem like a good dessert tea, or a nice treat anytime. For any of you dealing with high blood pressure, this could be a delicious way of helping manage that challenge! I was busy organizing in my craft room one evening when I came across a sack of old sewing tools my mom had passed along from one of her junking expeditions. Amongst the rusty old pieces was an old plastic box containing a matching pen and pencil with dark navy blue barrels. 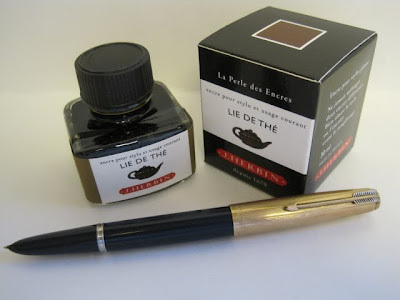 Now I am a pen fanatic anyway, and I love pens almost as much as I love teawares. I like old pens, new pens, cheap pens, fancy pens ... if there's a new type of pen out there, I want to try it! So I had to research vintage pens, and I found a wonderful web site which told me that this Parker 51 is considered "a triumph of styling" and "one of the most robust and practical writing instruments ever made." The mechanism that holds the ink is rather interesting, and of course it was bone dry so I needed some ink. 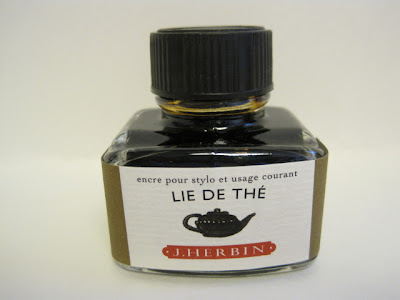 Thus, I was now at liberty to order that J. Herbin ink with the cute teapot on the bottle, perhaps the only ink they've ever sold because of the graphic! 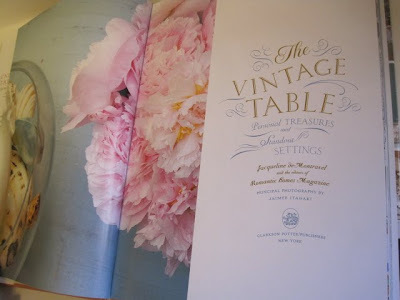 When a review copy of "The Vintage Table" arrived on my desk, I knew from one glimpse at the beautiful interior I was going to love it. The book, written by Jacqueline de Montravel and the editors of Romantic Homes, is subtitled "Personal Treasures and Standout Settings," and I'm happy to say this is one volume that lives up to its publicity. Even the title page is pretty, and I think the typography shown here and on the cover is just so very lovely. 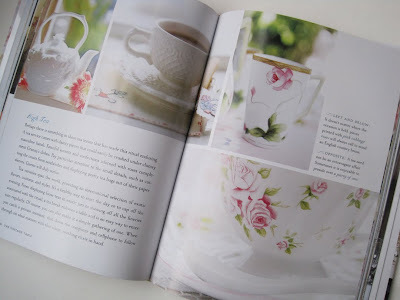 Fans of the shabby chic style of decorating will find much to admire in this book, including many images of vintage teawares in rose print designs. The book also has lots to say about the dishes we use daily, and this quote told me I was among kindred spirits: "Everyday dishware is like the friend you can count on to make you smile." 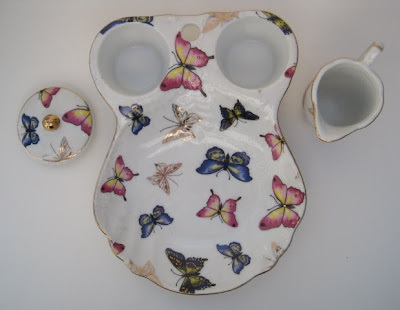 That's certainly how I feel about the Johnson Brothers Rose Chintz dishes I use every day! 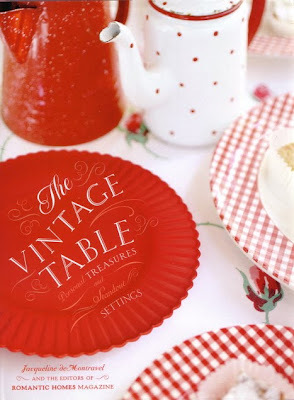 It's not all roses and pastels, however, as this cheery red table setting beautifully shows. 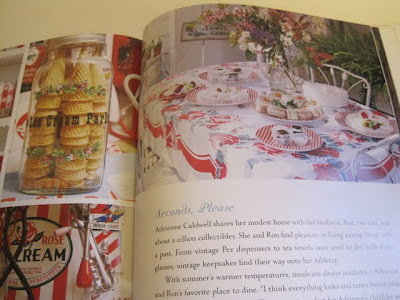 There is lots of eye candy in this book, but it also encourages you to make an inventory of your own tablewares and consider new ways of combining them. I was surprised at how reading this book reminded me of my grandmother's pink crocheted tablecloth I haven't used in ages, and how I suddenly recalled those new teapot placecard holders I've never even taken out of the package. My favorite recommendation from the book? 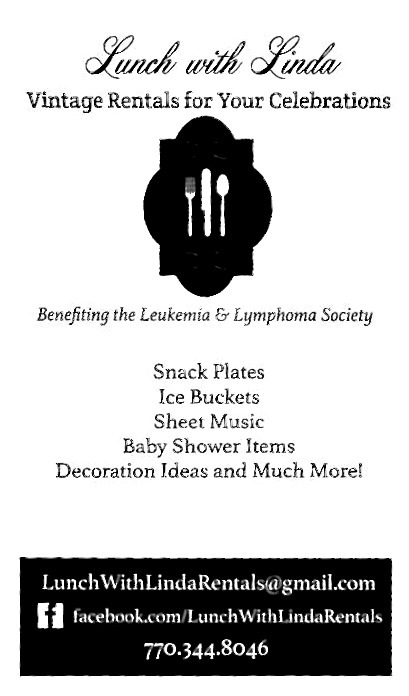 Start keeping a tableware diary! Now isn't that just a grand idea? It's one of many I took away from reading this beautiful, and useful, new book. 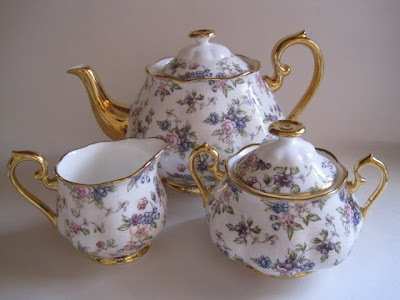 According to the Royal Doulton web site, the retail price for this Royal Albert 1940's Chintz tea set is $300. They currently have it on sale for $149.99. Last I checked eBay, it was $120. Mine, however, was less than $20! 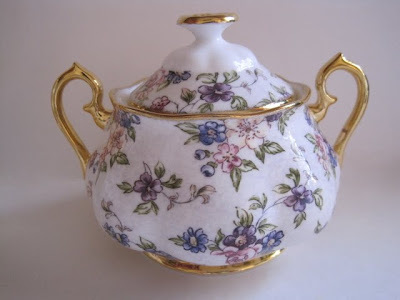 A week or so ago, you see, my friend Sandra sent an e-mail alert that T.J. Maxx had these Royal Albert 1940's Chintz teapots for sale, so I knew I needed to get over there. 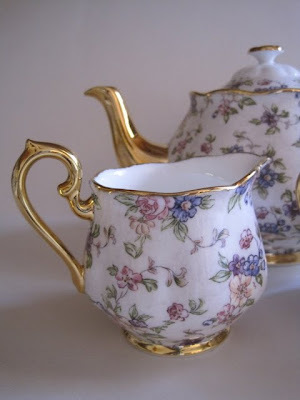 No one understands my taste in teawares (and chintzware) better than she does, so if she thought I'd like it, I would. Furthermore, I had on hand a $10 T.J. Maxx gift certificate I just hadn't been inspired to use. 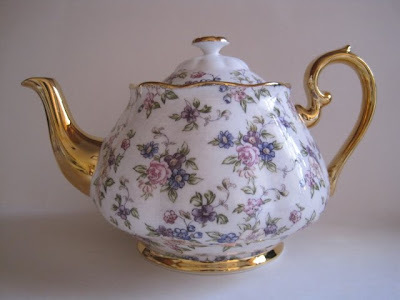 When I found this lovely teapot for $19.99 (already a great price) and realized I could get it for $9.99, I was sold. 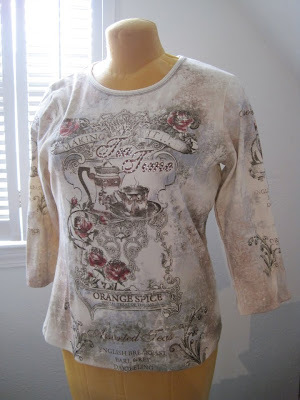 Then I got another $10 gift certificate (for using my T.J. Maxx rewards card), so I went back for the sugar and creamer. They were $9.99 each, which basically means I got one of them for free. 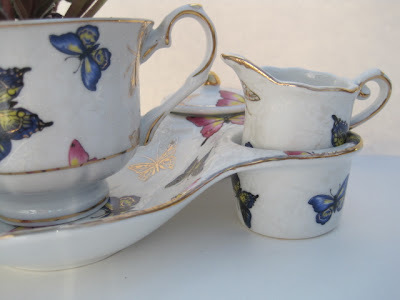 Grand total for the tea set: $19.97. These surely must be "seconds," but for the life of me I cannot find a single flaw, and I have tried to find one! 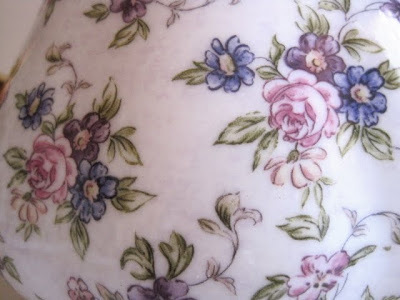 I like the simple elegance of the pattern, and I have lots of pieces I think would mix well with it. 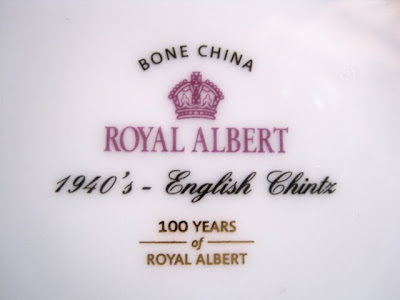 This is a commemorative pattern celebrating 100 years of Royal Albert. I'm just celebrating my bargain! 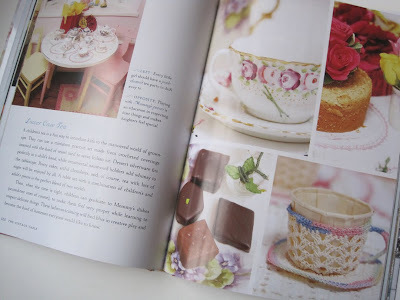 Tea and Books Saturday #8 - "Tea: A Little Indulgence"
Don't be fooled by its small size, for this 120-page book may be just 5-5/8 x 5-1/4 inches but it is packed with tea info and some of the most tempting tea recipes I've seen in ages. I believe I must have found my copy on eBay a year or so ago. I remember buying a couple of tea titles simply because they were 99 cents and no one else bid on them, and this may be one of those acquisitions. At any rate, I set it aside and was delighted when I opened it recently to discover some tea history, facts and quotes, a tea timeline, and most fun of all, those 91 luscious tea recipes! In the text of the book I learned that Winston Churchill drank his lapsang souchong with Scotch (I'd require liquor too if I had to drink that horrid stuff all the time! ), and that Abraham Lincoln once said "If this is coffee, please bring me some tea; if this is tea, please bring me some coffee." But the recipes are what make this book such a find, as there are recipes for all sorts of foods I now want to try. In beverages, I like the sound of Herb Lavender Tea, Blueberry Teatime Smoothie and Chocolate Chai. (There's also a Tea Egg Nog recipe for those who like egg nog.) The sweets that sound most tempting include Tea Leaf Shortbread, Chai Banana Bread, Lemon Tea Biscotti and Peach Tea Cobbler. And for main dish recipes with tea, I'm interested in the Black Bean Soup, Mandarin Orange Meat Balls and Seafood Chowder. Hungry yet? 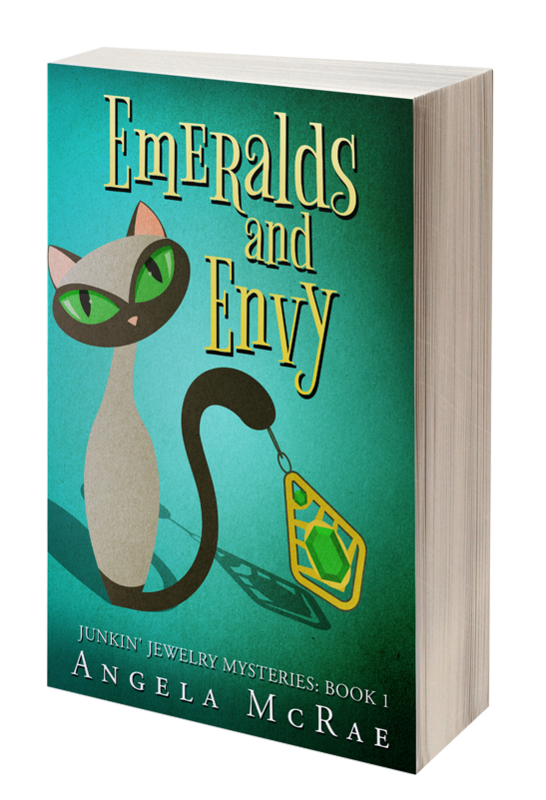 I think you will be after exploring this delightful little book! 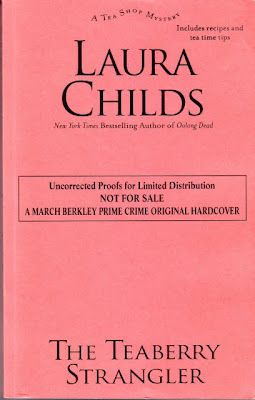 Do you know what "galley" or "proof" copies of books are? I'm not sure if the term is known outside the publishing business, but these are the advance reading copies of books authors and publicists sometimes send to members of the media to help get the word out about their new releases. 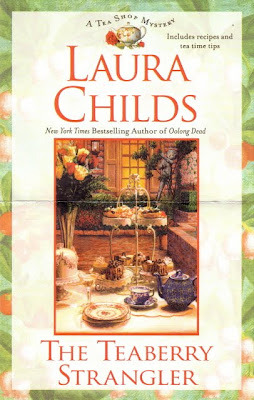 I've gotten plenty of these over the years, but for the first time I have received one for an upcoming tea shop mystery by Laura Childs, "The Teaberry Strangler." I was particularly happy to get this one since I am always quite eager to find out what's been going on with our beloved Theodosia Browning and friends at the Indigo Tea Shop in Charleston! There's lots going on in the business and civic community this time, including an important literary evening at the Heritage Society, the opening of a new perfume shop, and a huge fashion show at Cotton Duck. 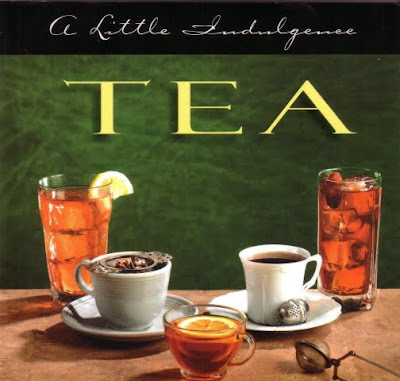 We also learn that Theo reads Tea: A Magazine just like many of us do, which was fun to see, and naturally I'm looking to order some Teaberry Tea after reading about it in this book. 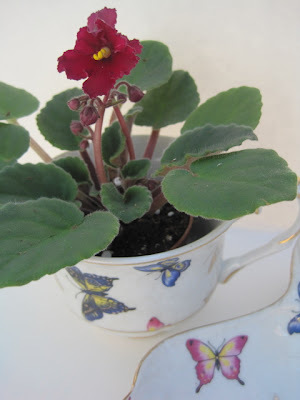 Childs has included a helpful list of tea resources, and it's fun to see the magazines, vendors, websites and blogs she recommends. (I was proud to see our friend Bernideen included!) And of course there are the usual great recipes, which I keep hoping will be compiled into "The Indigo Tea Shop Cookbook" one day. Meanwhile, "The Teaberry Strangler" will be released March 2, and below is a photocopy of what the "real" cover will look like. And yes, I'll be buying a copy just like everyone else to add to my collection! 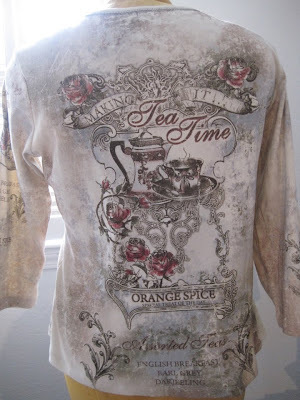 A fun new "tea shirt"
Once in a very great while, I pay full retail price. I don't question it. I don't quibble or dicker. I don't try to get a better deal on eBay or Amazon. I don't go to my beloved retailmenot.com looking for a discount code. I just pony up the cash and move on. 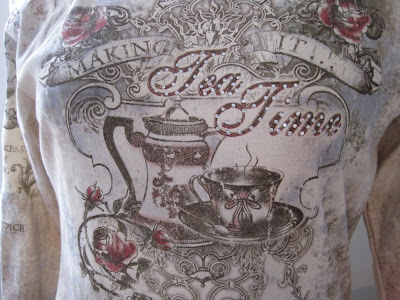 And that was the case when I plunked down my $24.99 for this "tea shirt" at my local Cracker Barrel on Friday. ... and even the sleeves. The kindness of readers I've never even met just continues to amaze me! A few weeks ago, I got an e-mail from Susan in Ohio letting me know she'd found a tea goodie at an antique mall and it was headed my way. I was *thrilled* to open the package and find a bit of teaware I've never even seen before, much less owned, and here it is! This side view shows you that the base is constructed with two built-in compartments to hold the sugar and cream. How's that for efficient design? I love it! 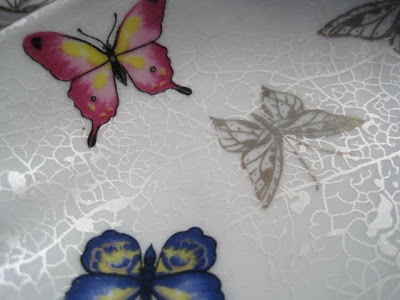 And I had to get a close-up shot so you can see what may not be apparent in the other photos: these gorgeous butterflies, some in color, some metallic, are flying against a beautiful lacy backdrop that shimmers across the surface of these lovely pieces. 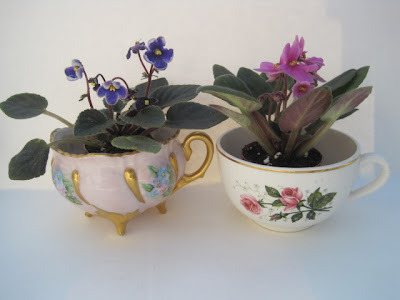 And when I saw that burgundy butterfly wing next to my new teacup African violet with the burgundy leaves, I knew it was a match made in heaven. 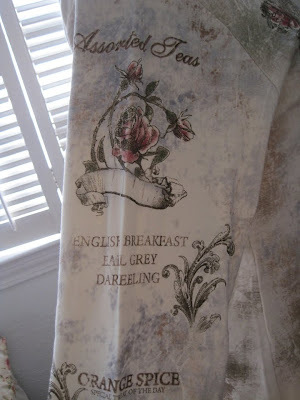 Can you see why I so treasure this piece from my tea friend in Ohio? 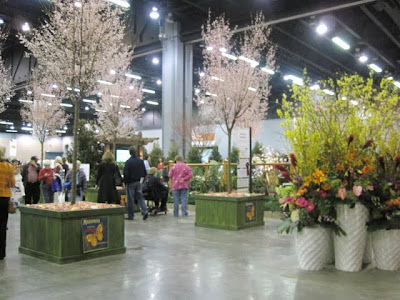 If all the snow coverage is starting to get to you, let's spice things up with a little color from the Southeastern Flower Show! 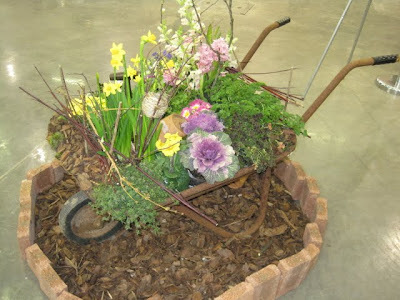 My friend Deberah and I, who are planning a garden-themed issue of our magazine, visited the show in Atlanta on Feb. 5. 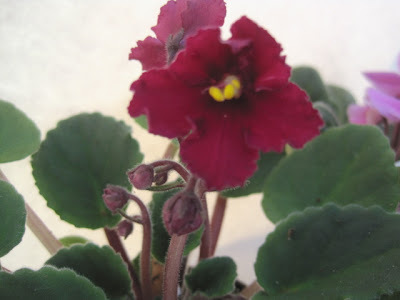 There's nothing like seeing a few indoor gardens and some colorful blossoms to remind you that spring will be here soon, and it's not too early to begin thinking about gardening! 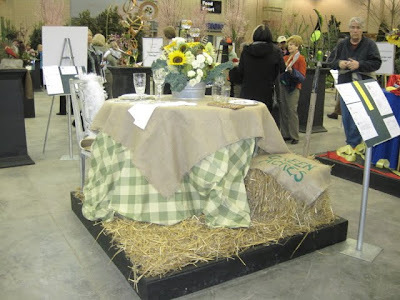 The Atlanta area garden clubs create often whimsical table settings, this year with a "green" theme. 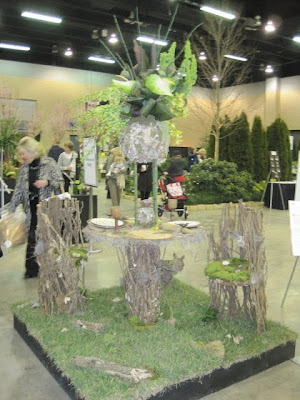 I thought this mossy green setting was just lovely! 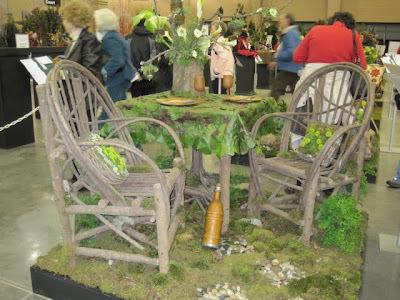 "Dining Alfresco with Mother Nature" was the theme of this table. 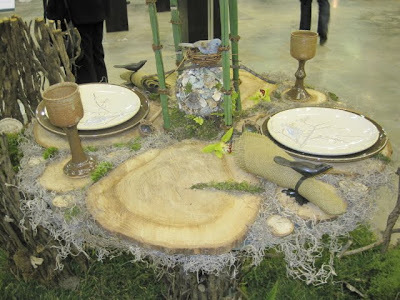 Loved the twiggy seating! 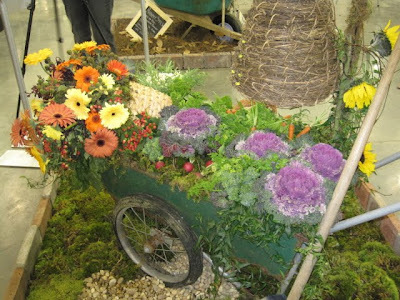 In one section of the flower show, the entries featured pretty plantings in wheelbarrows. 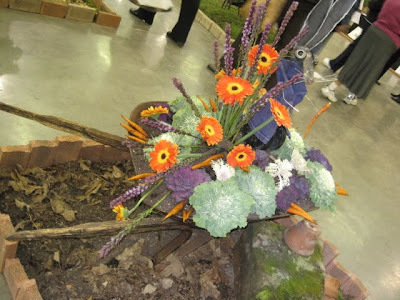 Definitely an interesting "container" for plants! 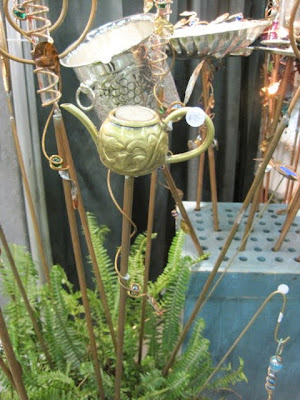 One booth was filled with garden accents made from old metal plates, dishes and flatware. 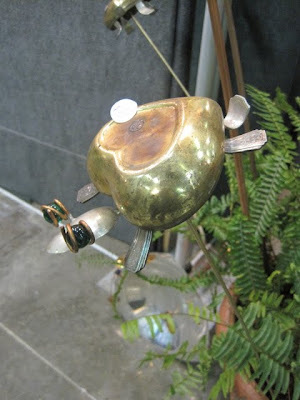 How clever to use the old silverplate for the legs on this little turtle guy! 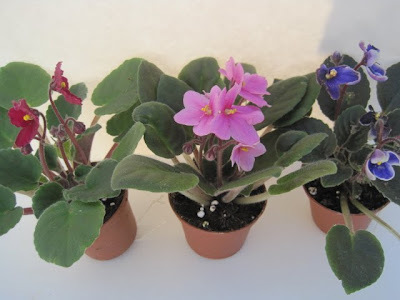 There is always a vendor market at the flower show, and if it hadn't been for Deberah I would have missed these miniature violets, which are perfect for the teacup African violet display I wrote about here after reading Kimber Mitchell's great article in the Early Spring 2010 issue of Country Gardens magazine. 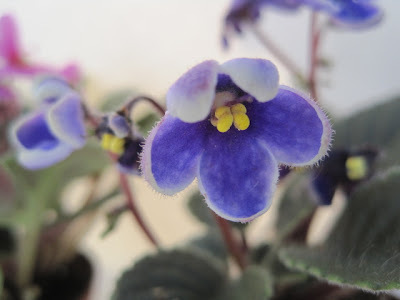 I had quickly learned through a little online research that it would be very expensive to have miniature violets shipped to me, so I was quite happy to find these for a reasonable $6 each. How to Tea Party in the Snow! 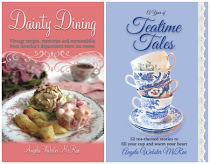 Tea and Books Saturday #7 - "A Decent Cup of Tea"
Tea & Books Saturday #6 - "Tea with the Bennets"
Soup's on -- and it's pretty!